Grill the burger to desired level of doneness. Place the cheese on the burger during the last minute of cooking to melt the cheese. Lightly brush the cut side of the hamburger bun with the oil and place the bun on a hot grill until toasted. Place the burger on the cut side of the bottom portion of the bun. Top the burger with the ketchup, mustard and the potato chips. 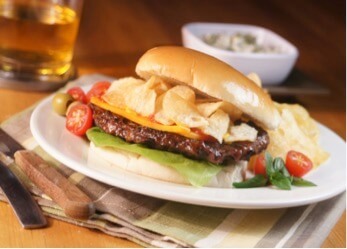 Place the top portion of the bun on the burger and enjoy a delicious crunchy burger.